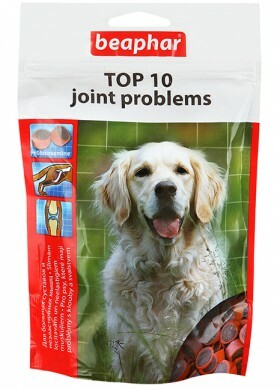 Feed additive for dogs – problems with ligaments and joints (unwillingness to walk, lethargy or difficulty when traveling on ladders). Contains glucosamine. Glucosamine is used both for the healing of joints, and for maintaining them in the optimal form. Cereals, vegetable protein extract, meat and meat by-products (minimum 4% of rabbit and minimum 44 chicken), mollusks and crustaceans (minimum 4% glucosamine = 40,000 mg.kg) minerals, sugar, water. Every day 1 cup for 5 kg of animal weight. After 7-8 weeks, you can reduce the daily dosage to 1 pc. At 10 kg, without reducing the effectiveness.